This quick and easy chocolate turtles recipe is another simple recipe that you can make over the holidays that will impress your family and friends without any real difficulty on your part. I found this recipe at allrecipes.com originally, but here's my simple version for you. By the way, in the photo above you'll see that there are also some quick and easy chocolate pretzels that I made, too. You'll find instructions on making those on their own recipe page. Okay, back to the "how to" of making these mini pretzel turtles. chocolate covered caramel candies - I used Rolo candy. They were perfect, but you could use Milk Duds, Hershey's caramel filled kisses, or something similar. I know traditional chocolate turtles don't have pretzels, but that's quite okay with me. The pretzels just add an extra dimension of flavor and crunch! First you need to get the oven hot by preheating it to 300 degrees Fahrenheit (or 150 degrees Celsius). paper. Place one layer of the pretzels on each tray. 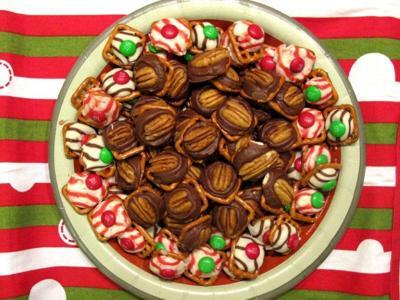 Cover each pretzel with one of your Rolos or other chocolate covered caramel pieces. Place the trays in the oven and bake for about 4 minutes. Do keep an eye on them because you don't want to have them melting all over the place. You just want them to be warm through. Remove the trays from the oven and quickly press one of the pecan halves onto the top of each chocolate caramel piece. Once the chocolate turtles have set, you can store them in an airtight container until you are ready to serve them. That's it! Now all you have to do is enjoy them! These quick and easy chocolate turtles are just as delightful as the chocolate pretzels you made. Thanks again for being willing to share your photo and recipe with us. The combination of chocolate, caramel, pretzel, and pecan is scrumptious and one I think everyone will appreciate. I hope you'll take the time to add your future candy creations here to the site as well when you make them. We can never get enough. Seeing the images is so much more motivating, too. I can't resist once I've seen the finished product.